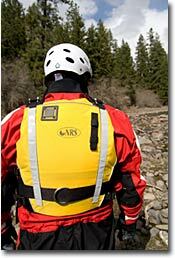 NRS Rapid Rescuer PFD, showing rescue belt and steel rescue ring. Their specialized features require training and practice to use safely. Used properly, they will expand your capabilities. But there are real pitfalls for unskilled users. At best, you’re buying a product with $70 worth of useless bells and whistles. At worst, a rescue vest can put you in situations that you’re not prepared to handle. Attaching a rope to a rescue vest and being lowered into fast current is hazardous. The quick release harness, while reliable in skilled hands, is NOT foolproof. Even in mild current, the forces that build up are impressive. Used incorrectly, it can jam and put the user in a dangerous spot. If you don’t know its limitations, and what to do if something goes wrong, you could die. You’ve probably seen people use a rescue PFD to tow a free-floating kayak to shore. It’s harder then it looks. If the towed boat washes into a hole or pins on a rock things will get ugly fast. Even skilled users are wary of towing on anything harder than fast-moving flat water or easy, unobstructed rapids. They’re reluctant to hook onto a kayak without flotation that’s floating low in the water. And they’re smart enough to practice in mild current before being confronted with an actual situation. NRS swiftwater rescue training session with Charlie Walbridge. Paco, tethered to shore by his rescue belt, performs a mid-river catch on Cody. Responsible rescue vest buyers quickly take steps to familiarize themselves with their new gear. 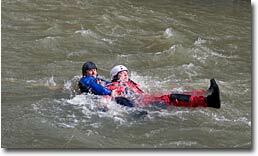 If you haven’t taken a swiftwater rescue class, do so soon, and don’t use the rescue harness until after you’ve learned the basics. Whitewater Self Defense from Performance Video provides an excellent overview of procedures. Additional practice helps you learn your personal limitations. Lastly, never forget that the decision to use a rescue vest, like the decision to run a river, is yours alone. Don’t get pressured into doing something you can’t handle safely.